Apple is on a roll, whether it’s the new iPhones or new products like its well-received AirPods. But what sometimes gets lost is Apple’s roots: It was, after all, known as Apple Computer Co. when it began in 1977. And Apple does still launch new and improved computers every year. Last year, the company launched the all-new series of MacBooks that are lighter and more compact than the MacBook Air, but are as powerful as the MacBook Pro. Apple’s Mac has a very well-polished and thriving ecosystem of software and is one of the most compact notebooks available in the market today. All Apple users can download their favorite applications from the App Store. As per recent statistics, the App Store now contains over 2.2 million apps to choose from. However, some productivity applications and many graphic-intense applications such as games are still confined to Windows. You don’t need to get disheartened that you can’t play your favorite games on a Mac. There are a lot of possible ways to run Windows-specific software on your Mac. Here are some of the preferred and widely used methods of running Windows on Mac. This is one of the simplest and widely used methods of using Windows features and apps on a Mac. Generally, a Mac’s hardware is powerful enough to handle multiple operating systems in it. To get the most of two operating systems, you can actually install Windows OS on a Mac. Accordingly, Apple provides its Mac devices with Boot Camp, which is an effective and safe way to boot multiple OS on a Mac machine simultaneously, including Windows on Mac. Apple’s Boot Camp is an option to install multiple operating systems in a Mac-based device and comes pre-installed with Mac OS. Using Boot Camp is one of the safest options you have to boot multiple operating systems. However, in order to do so, you’ll need to purchase a valid Windows license. Boot Camp sets up a partition on the hard drive so that you can install other operating systems of your choice. And since the installed operating system will be running directly off the hard drive, running Windows or any other OS using Boot Camp provides a far better and more fluid experience than any virtual machine can offer. Before you start the process of installing Windows OS using Boot Camp, it is advisable to first install all the latest updates from Apple and take a backup of all your essential data. Running Boot Camp is very easy and is guided by on-screen prompts with OS X 10.6 or later. 1) Find the Boot Camp Assistance application from the utilities and launch the assistance. 2) Click continue, and if prompted to download the latest Windows support software, do not skip it! Download the software. This will install most of the essential drivers for Windows. 3) After you’re done installing the software updates, you’ll now be taken to the partitioning screen, where you need to partition your hard drive for allocating space to the Windows OS. 4) Set up the space using the slider on the screen and click on Partition. 5) Once the partition is completed you’ll need to insert the Windows installation disk in the Mac optical drive and start the installation process. 6) The Windows installation process is also guided by simple on-screen prompts. 7) During the installation, you might be asked to select the location to install Windows OS. If prompted, select the partition made in step 3 & 4. 8) After the Windows OS is installed, you’ll need to install and set up the drivers and choose the default OS to boot. Safest possible option to install a fully functional Windows on Mac. Can use full capabilities of the hardware. Offers support for all the drivers and ports. Requires a restart every time you wish to switch between the OS. Limited storage limit due to disk partitioning. Need to purchase a Windows license key to install Windows on Mac. Virtual machines are one of the most common ways of running multiple operating systems on a single device. These VMs works on the concept of virtualization, which creates a virtual computer within your actual computer. It can provide complete access to your computer hardware. Assuming that your machine possesses the required hardware capabilities, virtual machines allow you to emulate your desired OS so you can run multiple operating systems on a single machine. However, these applications will be running in the background inside the virtual machine. To use this service, make sure you have a valid Windows license to install on a virtual machine. 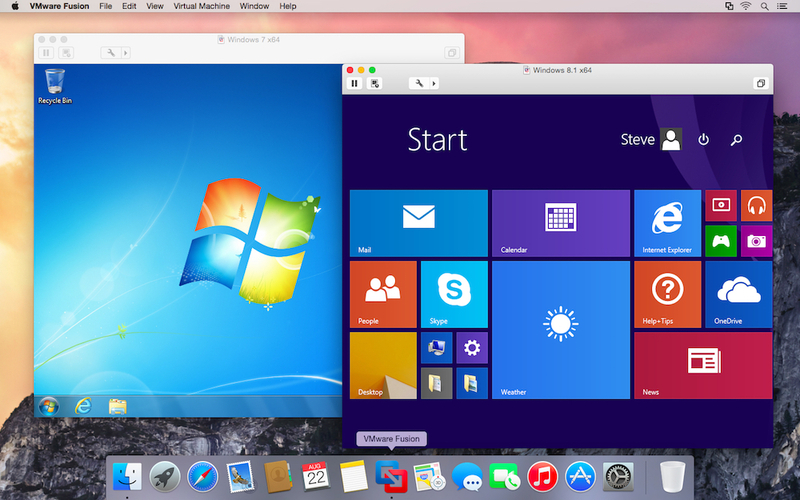 Some of the most popular paid virtual machines for Mac include Parallels and VMware fusion. You can also use free and open source virtual machines such as VirtualBox and QEMU. Although these virtual machines can serve your purpose by running Windows software and applications, be aware that the graphics performance isn’t at its best. So, if your primary need is to run Windows games on your Mac, virtual machines might disappoint you. Can run Windows software on your Mac directly without rebooting the system every time you need to switch between the OS. Need not purchase and install the complete Windows OS. Availability, easy maintenance, convenient recovery, and application provisioning. Not meant for graphic-intense usage such as gaming. Not as efficient in accessing the hardware as that of a real OS. If you don’t want the hassle of partitioning your hard drive or installing software to emulate Windows, then accessing Windows software via a remote desktop might just be your call. Remote desktops will allow you to run any Windows application using a remote connection. 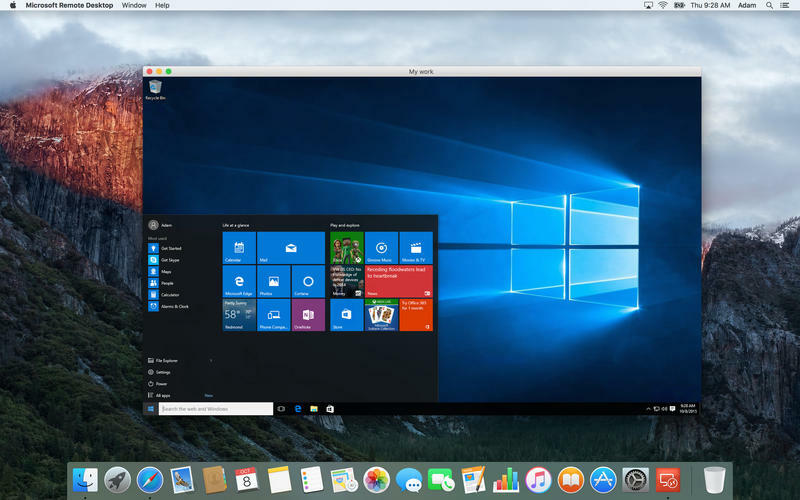 If you work with an organization or a company, then you might easily get remote access to a Windows machine for your Mac to work on. If you are a normal home user, you might need to use your old Windows PC to set a remote desktop connection with your Mac. Most of the leading cloud platforms have already started providing remote desktop connections as per the user’s requirements. The whole concept of renting computing machinery is carried out in the cloud over the Internet. 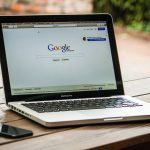 But these remote connections are often restricted within an intranet, and if you want to use it outside your home or organization, you’ll need to set a VPN connection or use third-party software such as TeamViewer. You can also install the Chrome browser on your Mac and add Chrome Remote Desktop extension to it. Once this extension is added, you will be able to connect to a Windows PC running Chrome browser from your Mac. Do bear in mind that these remote connection sessions do not provide an ideal environment to use graphics-intensive applications or PC games. Remote connections consume a considerable amount of time to render the content through a network. Encrypted remote sessions make them secure. When the network is down, the entire concept of remote desktop fails. Restricted access to the remote system can hinder some functionalities while Windows on Mac. Can struggle with heavy tasks and applications. If you need to run only a few specific Windows applications on your Mac, then you might be able to do that without the hassle and expense of installing an entire Windows OS or renting a remote desktop. There are some applications that let you run Windows-based programs and applications directly on your Mac. And the best part about these applications is that most of them are absolutely free and are very easy to install and use. 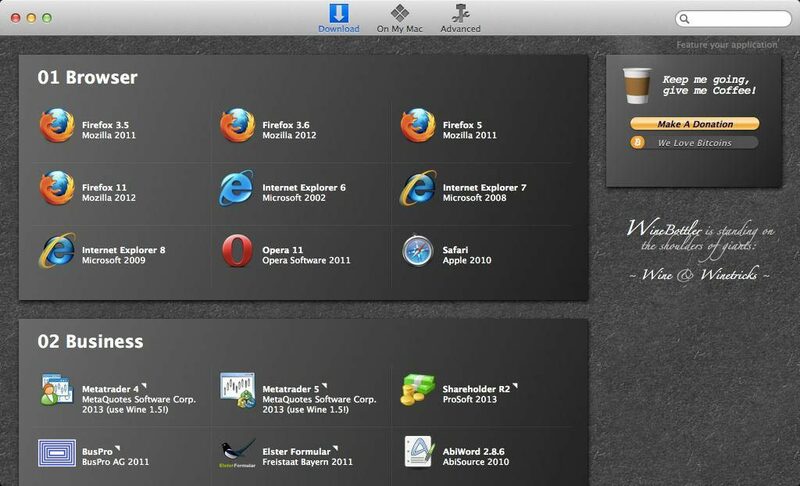 WineBottler is a free Mac application that packages most of the Windows-based applications to comfortably run on your Mac. It doesn’t need to install any emulators or virtualizers. Instead, it simply runs a Windows application directly on a Mac. Internally, WineBottler repacks all the Windows-specific files such as .exe or .msi files to run on a Mac. If you are fine with spending a small amount of money to run almost all of the Windows software and applications with a nice graphical interface, CrossOver Mac is another application that makes your work easy. This application internally utilizes the open source Wine code to run Windows on Mac. Although CrossOver Mac provides a very polished user interface along with compatibility, it’s still based on Wine and, therefore, won’t work with everything. Although these third-party applications relieve users from the cumbersome process of installing an OS to run Windows software, they are prone to bugs and issues. Confined to very specific usage. Might contain bugs and other issues. So, which Windows on Mac solution to choose? If you are looking for a particular application or some other productive Windows tool to run on your Mac, then choosing a third-party application should suffice your needs. On the other hand, if your work demands the use of a Windows machine, try getting yourself a remote desktop from the organization or from a cloud solutions partner. Both these methods work fine for low-to-moderate usage. However, if you are looking for a more powerful and durable solution to house both Windows and Mac in one device, you might have to proceed with either Boot Camp or virtual machines. To sum up, the best method for running Windows on Mac: We’d recommend you do both. Yes, you’ve read it right. Set up a complete Windows OS using Boot Camp’s disk partition and later install any of the virtualization software we mentioned in the Mac OS. Now comes the tricky part: Configuring the virtual machine to use the Boot Camp partition of Windows OS. This way, when you need to use your device for some gaming or other high-end intense usage, you boot into the Windows OS with a restart. And when you want to perform regular Windows tasks, just use the virtual machine, skipping the hassle of restarting the device. This way, the VM will perform a lot better as it is actually mapped to a real disk partition of Windows OS. So, with this Windows on Mac solution, you get the best of both OS, depending on your requirements and needs.